On Friday 2 May 2014 the Worcestershire Branch of the Royal British Legion’s Poppy Appeal held an Awards Evening at Dancox House, 214 Battery RA’s Army Reserve Centre to celebrate the outstanding efforts of the county’s Army, Sea and Air Cadets. Army Cadet Forces, Sea Cadets and Air Training Corp’s (ATC) from across the county attended the event to accept their awards for the money they raised for the 2013 Poppy Appeal. 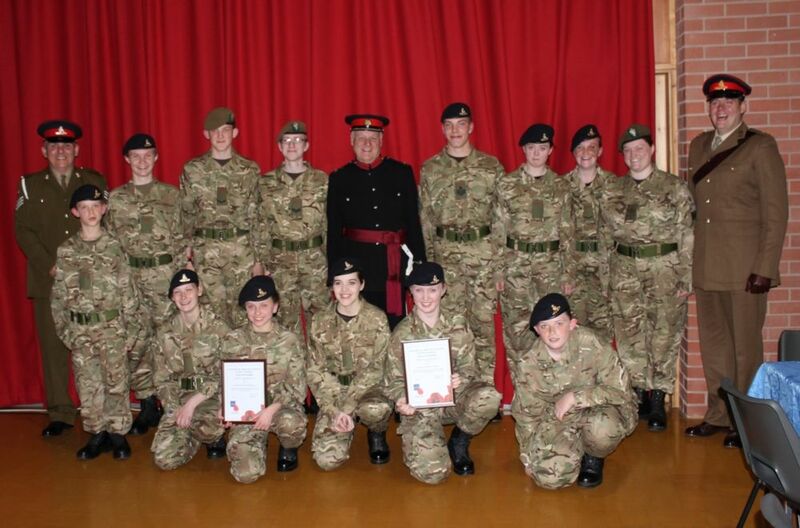 The awards were presented by Deputy Lord Lieutenant Andrew Grant and the evening was hosted by Nick Martin, Community Fundraiser for Worcestershire Poppy Appeal. The top three individuals who collected the most money were all from St Johns Army Cadet Force. Olivia Pugh raised £1,170.03, Sophie Lee raised £447.20 and Billie Jo Grogan raised £344.75. Other awards included 187 City of Worcester Squadron ATC who raised £1,231.81, 516 Squadron ATC Kidderminster who raised £797.11 and Malvern Sea Cadets who raised £1,036.48. - In 2013 they spent £84 million on health and welfare for the service community. - Provided benefits and money advice to 11,400 people in 2013. - Provided immediate needs grants to 25,000 beneficiaries in 2013. - Provide four Poppy break homes for the Armed Forces community and service children. If you have any questions or would like to find out more about the Poppy Appeal you can call their contact centre on 0808 802 8080.